Femen gafı Meclis’i alarma geçirdi! This entry was posted in TR and tagged haber on December 29, 2014 by FEMEN. La manifestante está ya en libertad pero se le ha prohibido el acceso al Estado de la Ciudad del Vaticano. La mujer es una ucraniana de nombre Yana Azhdánova. 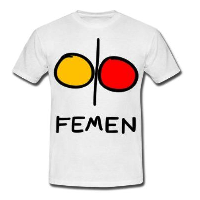 This entry was posted in ES and tagged noticias on December 29, 2014 by FEMEN. This entry was posted in FR and tagged nouvelles on December 29, 2014 by FEMEN. Femen gafı Meclis’i alarmı geçirdi! This entry was posted in PL and tagged nowości on December 29, 2014 by FEMEN. This entry was posted in CH and tagged 新闻 on December 29, 2014 by FEMEN.